Behind the youthful beauty of Miss Ann Go is a person of truly amazing skill, intelligence, hard work and dedication. Miss Go, from the Philippines, is one of the world's leading PhD researchers in the field of neurophotonics using a unique microscopic system developed at the ANU. In fact, there are only a few systems of its type being used in the world today. One is at the world renowned John Curtin School of Medical Research (JCSMR), Australian National University in Canberra [pictured below]. The JCSMR is Australia's premiere national medical research institute which has produced Nobel prize winners. Mapping the brain with lasers will lead to many new discoveries including helping find cures to diseases. The unique equipment used by Miss Go is a novel two-photon microscope, which is designed with a 3D holographic laser projector, developed by Dr Daria and Miss Go at the ANU. It relies on photostimulation or light induced generation of neuronal signals to study how neurons process and integrate information. Special guest Joe D Mango in the studio last week. Joe is a well known Manila radio and TV personality since the 1980s. Joe became famous as the Love Guru, or the 'Dr. of Relationships'. He is the host of "Love Notes". Joe now lives in Canberra after migrating to Canberra with his beautiful family just a few months ago. Joe received permanent residency after receiving an elite state sponsorship for being a high achiever as an interior designer and media personality. Professor Zoleta-Nantes, ANU, is an expert in human ecology, development and environmental sustainability in the Philippines. She is also a member of the Philippine Studies Group (PSG) which meets in Canberra every month. You can also listen to Prof. Zoleta-Nantes' interview which was broadcast on Saturady 3rd August by navigating to the "Interview Archive" page (full interview) or "Broadcast Archive" page (edited interview). Mrs Carolan completed a Bachelor of Science Degree major in Accounting and Management from the University of Santo Tomas in Manila. Volet then worked at the Australian Embassy in Manila for 10 years. She met my husband Bill Carolan in 1983 when he was posted at the Australian Embassy where Volet was the Senior Accountant. They got married in 1985 and have 3 sons, James, Matthew and John. From Manila, Volet and Bill moved to Canberra in 1987. Volet accompanied Bill on overseas postings in Nauru, Ottawa and Athens. Volet worked in Comsuper in 1992-1995, the Department of Foreign Affairs and Trade in 1995-2001, and the the Department of Immigration and Ethnic Affairs 2001-2004. Volet is now a Senior Financial Accountant at the Australian Taxation Office where she has been since 2004 to the present. 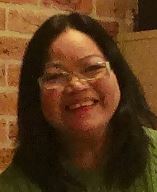 She has been active in the Filipino Community in Canberra. She has a column called ‘Canberra Corner’ in the Philippine Community Herald newspaper, which has an Australia wide circulation. She was a recipient of the 2007 Filipino Australian Women Achievers Award from the Philippine Embassy and outstanding Community Leader award from the President of the Filipino Community Council of the ACT in 2007 and 2012. She was a member of the Commission for Women in the Archdiocese of Canberra and Goulburn. She was also active in the Canberra Rosary group- we pray the Rosary in Filipino homes every Saturday afternoon. She loves to cook, working in her garden and loves to sing karaoke. She love traveling in Australia and overseas. Volet initiated the founding of the Filipino Community Council of the ACT Inc in 1995, after having attended the FILCCA conference in Sydney in 1993. FCCACT is the umbrella organisation of a number of Filipino organisations in Canberra. The audio below can also be found on the Previous Interviews page. Acram Latiph is a PhD student at Crawford School of Public Policy in the ANU. His research is on provincial growth income in the Philippines with a focus on development challenges in the provinces of the Autonomous Region in Muslim Mindanao. Acram has studied Economics at San Beda College, Manila and he also completed a course in Finance at the University of the Philippines. He holds a Master of Public Policy from the Syracuse University in New York City under the Fulbright Scholarship. Acram taught Economics at Mindanao State University. He also worked as an AusAID project manager for different private investments in Mindanao. He is finishing his doctorate degree at the ANU as a recipient of the Australian Leadership Award Scholarship. See also Previous Interviews page for Filipino and English language audio interviews with Mr Latiph regarding the economic, social and political challenges facing the island of Mindanao. Augusto Verzosa, more commonly known as Toti, is a man of many talents. This makes Mr Verzosa one of those rare polymathic individuals who is able to successfully specialise in many areas. A polymath, also referred to as a "Renaissance Man or Woman" within academic circles, is a name which was made famous during the European Renaissance Age of Enlightenment for those exceptionally talented people who contributed to many areas of scientific study and thought. Toti is an ICT professional with a very impressive background, a past President of the Philippine Australian Association, ACT, an avid writer on international politics, economics and culture affecting Australia and the Asia Pacific region, a singer, composer, guitar and piano player, as well as an all rounded nice family guy. Toti's lively enthusiasm, positive nature and friendly personality endears him to all those he comes into contact with. Toti is currently a Principal Business Intelligence (BI) and Information Management Executive officer at Fujitsu, based in Canberra, and is responsible for the ACT, NSW, QLD and NT areas of operation. This involves managing business intelligence, analytics, information architecture, BI architecture, data mining, data warehousing, data management, data integration, data quality, and data governance. Mr. Verzosa was also National ICT Assistant Commissioner/Member and adviser to President Ramos of the Philippines for the ICT program of the whole Philippine Government. Toti has an impressive academic record. Amongst this was his post-graduate study in Electrical Engineering and Computer Science, at the University of Illinois, Chicago, USA, which he completed with high distinction. He also possesses a financial management qualification from the Asian Institute of Management. Toti has recently released three albums titled "Little Rose", "Bicycle" and "Child of the World". Mr Verzosa's skills as a pianist and guitarist are particularly impressive. The cover for the "Child of the World" album is displayed below. Dr Vincent Daria from the Philippines is an outstanding achiever on a world class scale. He works at the ANU, which is Australia's premier university. The ANU is also consistently considered amongst the top ranked universities in the world. Some of Dr Daria's areas of expertise are Lasers, Quantum Electronics and Neurosciences. He is currently working on mapping brain functions using lasers and has developed laboratory and scientific instruments for the ANU. Dr Daria went to school in Toledo City, Cebu. He obtained a Bachelor of Science (BS) in Applied Physics in the University of the Philippines (UP) Diliman. He studied under Prof. Caesar Saloma (now Chancellor of UP Diliman), who he considers as one of his inspirational teachers. Dr Daria's awards are impressive. He has a: National Research Council of the Philippines Achievement award in Physics; Third World Academy of Science Award for Young Scientist; National Academy of Science and Technology, Outstanding Young Scientist. He is also a member of the Philippine-American Academy of Science and Engineering (PAASE). His current work here in Canberra at the Australian National University (ANU) is at the 'leading edge' of neuroscience achievements in the world. Dr Daria demonstrates the depth of intellectual talent which the Philippines produces. The Philippines is the 12 largest country in the world measured by total population, with just over 100 million people. The Philippines is producing more intellectual talent every year. The Philippines is a great global citizen because it has so many people of Filipino heritage contributing to the social, economic, political and scientific fabric of this great planet we call "Earth". RFC would like to congratulate Dr Daria on his fantastic achievements. The Canberra Filipino community is glad to have a person of Dr Daria's caliber amongst us. Dr Daria is also one of the distinguished invitees for the launch of the RFC's inaugural broadcast. See also previous interviews page for audio interview with Dr Daria.